In the relatively obscure world of bobsleigh racing, Germany's Andre Lange is the sport's big name with three Olympic titles, eight world gold medals, seven European crowns and a multitude of World Cup honours. Now despite being on the wrong side of 36, the man known as the 'cannibal' targets a repeat of the rare two-man and four-man double he achieved at the Turin Games in 2006. He became only the fifth driver in history to pull off that feat on the Italian track and will be again the red-hot favourite when racing begins at the upcoming Vancouver Games. Lange has also shaken off the shadow of his gifted compatriot Christoph Langen in the two-man event, winning not only the Olympic title in 2006 but also world crowns in 2003, 2007 and 2008. He is also defending European champion and the 2008 World Cup winner. In the four-man event, his list of honours is even more impressive and includes two Olympic golds, five world titles (2000, 2003, 2004, 2005 et 2008), three European triumphs (2002, 2004, 2007) and four World Cups (2001, 2003, 2004 et 2008). Quite simply the former East German native is one of the sport's greatest ever champions. Born in Ilmenau, Lange started out with the luge as an eight-year-old and continued until 1993 when his powerful physique helped him make the transition to bobsleigh. Three years later, he sped to silver medals in both the two and four-man races at the junior world championships and in 2000 completed his rise to the top by winning the four-man world championship race and finishing second in the two-man event. A soldier in the German army, the driver from Oberhof continued to rack up medals before his Olympic winning performance in 2002 at Salt Lake helping to erase the disappointment of not being selected for the two-man event. 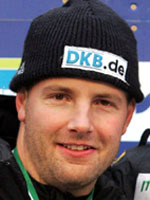 Since Langen retired in 2004, Lange has swept up top honours wherever he races and if he can hold off the likes of Russia's Alexander Zubkov and American Steven Holcomb in the four-man race, he could become the first bobsleigh racer to win three straight Olympic titles in the same event.